An ecclesiastical court; in Jewish usage, a body governing the Jewish congregations of a province or of a country; also the district administered by the consistory. The term was originally, and still is, applied in the Roman Catholic Church to the College of Cardinals, assembled for deliberation or to hear a solemn declaration from the pope. Similarly every bishop has the right to convene for the purpose of deliberation a consistory composed of priests of his diocese. After the Reformation the Protestant Church adopted this term for the body which governed the ecclesiastical affairs of a country. 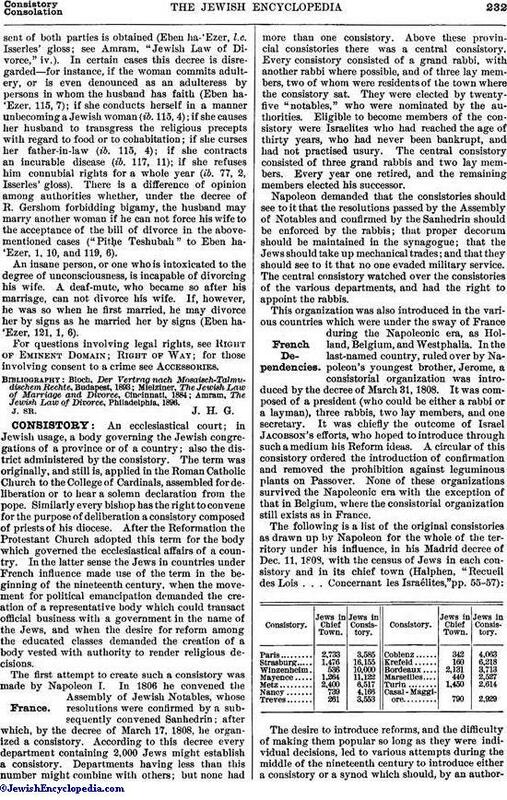 In the latter sense the Jews in countries under French influence made use of the term in the beginning of the nineteenth century, when the movement for political emancipation demanded the creation of a representative body which could transact official business with a government in the name of the Jews, and when the desire for reform among the educated classes demanded the creation of a body vested with authority to render religious decisions. The first attempt to create such a consistory was made by Napoleon I. 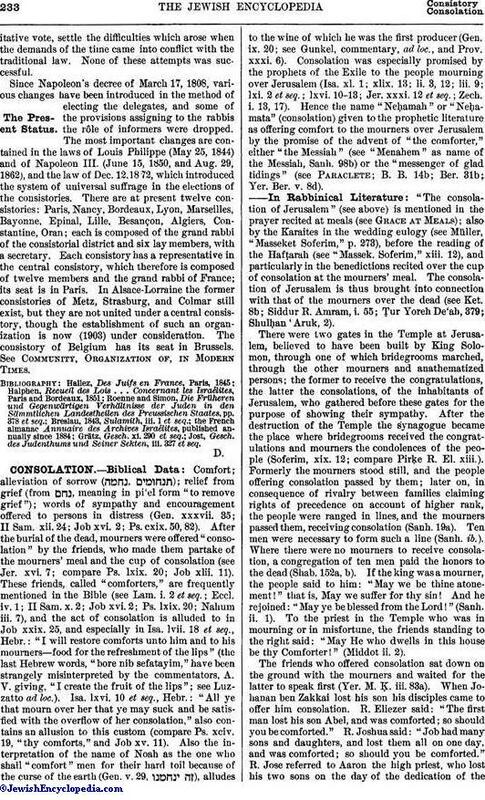 In 1806 he convened the Assembly of Jewish Notables, whose resolutions were confirmed by a subsequently convened Sanhedrin; after which, by the decree of March 17, 1808, he organized a consistory. According to this decree every department containing 2,000 Jews might establish a consistory. Departments having less than this number might combine with others; but none had more than one consistory. Above these provincial consistories there was a central consistory. Every consistory consisted of a grand rabbi, with another rabbi where possible, and of three lay members, two of whom were residents of the town where the consistory sat. They were elected by twenty-five "notables," who were nominated by the authorities. Eligible to become members of the consistory were Israelites who had reached the age of thirty years, who had never been bankrupt, and had not practised usury. The central consistory consisted of three grand rabbis and two lay members. Every year one retired, and the remaining members elected his successor. Napoleon demanded that the consistories should see to it that the resolutions passed by the Assembly of Notables and confirmed by the Sanhedrin should be enforced by the rabbis; that proper decorum should be maintained in the synagogue; that the Jews should take up mechanical trades; and that they should see to it that no one evaded military service. The central consistory watched over the consistories of the various departments, and had the right to appoint the rabbis. This organization was also introduced in the various countries which were under the sway of France during the Napoleonic era, as Holland, Belgium, and Westphalia. In the last-named country, ruled over by Napoleon's youngest brother, Jerome, a consistorial organization was introduced by the decree of March 31, 1808. It was composed of a president (who could be either a rabbi or a layman), three rabbis, two lay members, and one secretary. It was chiefly the outcome of Israel Jacobson's efforts, who hoped to introduce through such a medium his Reform ideas. A circular of this consistory ordered the introduction of confirmation and removed the prohibition against leguminous plants on Passover. None of these organizations survived the Napoleonic era with the exception of that in Belgium, where the consistorial organization still exists as in France. The desire to introduce reforms, and the difficulty of making them popular so long as they were individual decisions, led to various attempts during the middle of the nineteenth century to introduce either a consistory or a synod which should, by an authoritativevote, settle the difficulties which arose when the demands of the time came into conflict with the traditional law. None of these attempts was successful. Jost, Gesch. des Judenthums und Seiner Sekten, iii. 327 et seq.